Jeju Province, officially the Jeju Special Administrative Province, Jeju S.A.P., is one of the nine provinces of South Korea. The province is situated on and conterminous with the nation's largest island of Jeju (Hangul: 제주도; RR: Jejudo; [tɕe.dʑu.do]), formerly transliterated as Cheju, Cheju Do, etc., or known as Quelpart to Europeans. The island lies in the Korea Strait, southwest of South Jeolla Province, of which it was a part before it became a separate province in 1946. Its capital is Jeju City. Jeju Special Administrative Province has independent visa policy which varies from that of the Republic of Korea mainland. So, all ordinary passport holders excluding those from Afghanistan, Cuba, Ghana, Iraq, Kosovo, Libya, Macedonia, Nigeria, Palestine, Sudan or Syria can stay visa-free 30 days in Jeju Special Administrative Province, even if they normally require a visa for Republic of Korea mainland. Domestic flight doesn't require anything of identification, but exceptively, all people who try to enter the mainland of South Korea from Jeju Special Administrative Province must bring National Citizen ID Card (Korean:주민등록증) or passport with proper visa. According to legend, three demi-gods emerged from Samsung which is said to have been on the northern slopes of Mt. Halla and became the progenitors of the Jeju people who founded the Kingdom of Tamna. It has also been claimed that three brothers—including Ko-hu—who were the 15th descendants of Koulla, one of the Progenitors of the Jeju people, were received by the court of Silla, at which time the name Tamna was officially recognized, while the official government posts of Commander, Prince and Governor were conferred by the court upon the three. However, there is no concrete evidence of when the "Three Names" (Samseong-Ko, Yang and Pu) appeared nor for the exact date of when Ko-hu and his brothers were received by Silla. It may be supposed that the "Three Names" Founding Period occurred during the Three Kingdoms (Goguryeo, Baekje and Silla) Period on the mainland of Korea. Taejo, founder of Goryeo, attempted to establish the same relationship between Goryeo and Tamna as Tamna had had with Silla. Tamna refused to accept this position and the Goryeo court dispatched troops to force Tamna to submit. Ko ja-gyeon, chief of Tamna, submitted to Goryeo in 938 and sent his son, Prince Mallo, to Goryeo's court as a de facto hostage. In 1105 (King Sukjong's 10th year), the Goryeo court abolished the name Takna which had been used up to this time and, from that year on, the island was known as "Tamna-gun" (district) and Goryeo officials were sent to handle the affairs of the island. Tamna-country was changed to Tamna-county in 1153 during the reign of King Uijong and Choi Cheok-kyeong was posted as Tamna-Myeong or Chief of Tamna. During the reign of Gojong of Goryeo, Tamna was renamed "Jeju" which means "province across the sea". In 1271, General Kim Tong-jeong escaped with what remained of his Sambyeolcho force from Jindo and built the Hangpadu Fortress at Kwiil-chon from where they continued their fight against the combined Korean government-Mongolian army but within two years, faced by an enemy army of over 10,000 troops, the Sambyeolcho was annihilated. During the Joseon Dynasty (1392-1910), Jeju islanders were treated as foreigners and Jeju was considered as a place for horse breeding and exile for political prisoners. In the 17th Century, Injo of Joseon issued an edict prohibiting islanders from travelling to the Korean mainland. Consequently, Jeju islanders staged several major uprisings, including the Kang Je Geom Rebellion (1862), Bang Seong Chil Rebellion (1898), and the Lee Jae Su Rebellion (1901). In 1910, Japan annexed Korea, including Jeju, inaugurating a period of hardship and deprivation for the islanders, many of whom were compelled to travel to the mainland or Japan for work. Residents of Jeju were active in the Korean independence movement during the period of Japanese rule. On Jeju, the peak of resistance came in 1931–32 when haenyeo ("sea women") from six eastern villages launched a protest against the Japanese-controlled Divers Association. Before it was brutally crushed, the protests spread and eventually 17,000 people participated, with over 100 arrested in Korea's largest protest movement ever led by women and fisheries workers. On April 3, 1948, against a background of an ongoing ideological struggle for control of Korea and a variety of grievances held by islanders against the local authorities, the many communist sympathizers on the island attacked police stations and government offices. The brutal and often indiscriminate suppression of the leftist rebellion resulted in the deaths of tens of thousands of both villagers and communist radicals and the imprisonment of thousands more in internment camps. While claims have been made that the U.S. government oversaw and supported "anti-communist" activities administratively if not openly in the field, validation remains to be made. It is a fact the US was heavily involved in counter-insurgence operations across Korea at this time leading up to the Korean War and UN involvement. Similarly, the Northwest Youth League, a Korean government sponsored watchdog group made up of refugees who had fled North Korea, actively repressed any and all "communist sympathizers" with a campaign of shooting on sight anyone entering or leaving the president's "enemy zone" and using open, armed violence and what would be labeled today as terrorist activities. This led to the deaths of hundreds of islanders, with many other islanders being raped and tortured. Intolerance by mainland Korean officials of islanders in general at the time, government- and organization-sponsored isolation of the island and a rumored cover-up of evidence linking the rebellion's suppressors with foreign powers and people who have gone unprosecuted is believed to be the primary cause of public ignorance, hedging on denial, over the April 3, 1948 genocide on Cheju-do. A documentary by the BBC and PBS, Korea: The Unknown War and many activities and publications, including Sun-i Samch'on by Hyun Ki Young, by organizations and persons from within Cheju-do and around the world continue to attempt shedding the light on this event. The Uprising has become a symbol of Jeju's Independence from Korean Peninsula. The provincial administrative building was burned to the ground in September 1948 and a new building was completed in 1-do, 2-dong in December, 1952. Jeju Volcanic Island and Lava Tubes unanimously at the 31st World Heritage Committee June 27, 2007, was inscribed on the World Natural Heritage. In 1273, the Mongolian Yuan Dynasty established a military governor on the island, and for nearly a hundred years the island was effectively under the complete control of these governors. During the Joseon Dynasty, all of the administrative rights and systems of Jeju island, which had maintained some independence until this time, were absorbed into the centralized form of government established by Joseon. In 1402, the titles of Commander and Prince were abolished. In 1416, the island was divided into three major administrative districts: The area lying generally north of Mt. Halla was headed by a 'Moksa' or county magistrate, while the eastern area of Jeongui-county (today's Seongeup Folk village) and the south western area of Daejeong-county (today's Moseulpo, Daejeong-eup and Mt. Sanbang) were each headed by a Hyeon-gam (also county magistrate). In August 1864, both Jeongui and Daejeong hyeons were removed from the control of the 'moksa' north of the mountain in today's Jeju-si area and were renamed 'Gun" (county) and came under the direct control of the Gwanchalsa (governor) of Jeolla province. Because of strife between these 'Guns' and the Jeju 'moksa', the system was abolished in January, 1880 and the two 'Guns' reverted again to 'hyeon'. In 1895, Jeju-mok was redesignated as Jeju-Bu with a governor (Gwanchalsa) and Vice-governor (Chamsagwan) and a police agency was newly established, while in both Jeongui and Daejeong the offices of 'Gunsu' (county chief) were re-established. The very next year, the office of 'Gunsu' was abolished and the old system was restored. Then in 1906, abolishing the Moksa system altogether, the Gunsu or County chief system was adopted. In 1910, Jeongui and Daejeong were included in Jeju gun while Chuja-myeon was placed under the jurisdiction of Wando-gun, part of South Jeolla province. Japan annexed Korea in 1910. In 1915 the gun or county system which had been adopted in 1906 was abolished and Jeju island was designated as part of the 'island' system and called Jeju myeon under South Jeolla province. In 1931, Jeju-myeon was raised to the status of Jeju-eup or 'township' which gave the island one township (today's Jeju-si area) and 12 'myeon'. On September 1, 1955, Jeju Township was elevated to city status with 40 administrative wards which on January 1, 1962, were reduced to 14 wards. On July 8, 1956, Seogwi, Daejeong and Hallim-myeons were raised to the status of townships while the southwestern portion of Hallim Township was separated and newly designated as the Hankyeong district (myeon) which gave the province one city, two counties, three townships and 10 myeon or districts with 14 wards in Jeju City. May 23, 1979 saw the restructuring of the Jeju-si wards and the addition of three more, giving 17 wards. In March, 1980, the construction of a new provincial office was started in Yeon-dong of Jeju-si and in December of that year the four myeon of Aewol, Gujwa, Namwon and Seongsan were elevated to the status of townships giving the administrative area one city, two counties, seven townships, six districts and, within Jeju-si, 17 wards. In 1981, the development of the Jungmun Tourist Complex brought about the unification of Seogwi township and Jungmun-myeon (district) into one as Seogwipo-si consisting of 12 wards (dong) giving the province two cities, two counties, six townships, five districts and 29 wards. On October 1, 1983, Jeju-si's Samdo ward was divided into two wards to give a total of 30 wards in the province. Yongdam ward in Jeju-si was restructured into Yongdam ward one and Yongdam ward two on October 1, 1985. On April 1, 1986 Jocheon myeon (district) was elevated to the status of Township and Yeonpyeong-ri Gujwa township was raised to the status of Udo district (myeon). The provincial area now administered 2 cities, 2 counties, 7 townships, 5 districts and 31 wards, the status of the province as of 3 December 1996. Until 2005, Jeju Province was divided into two cities (si), Jeju and Seogwipo, and two counties (gun), Bukjeju (North Jeju) and Namjeju (South Jeju) respectively. The two cities were further divided into thirty-one neighbourhoods (dong), while the two counties were divided into seven towns (eup) and five districts (myeon). The seven towns and five districts were in turn divided into 551 villages (ri). In 2005, Jeju residents approved, by referendum, a proposal to merge Bukjeju County into Jeju City, and Namjeju County into Seogwipo City. Effective 1 July 2006, the province was also renamed Jeju Special Self-Governing Province with two nominal subdivisions, Jeju City and Seogwipo City. In addition to the changes in name, the province was given extensive administrative powers that had previously been reserved for the central government. This is part of plans to turn Jeju into a "Free International City". In Korean, do is the phonetic transcription of two distinct hanja (Chinese characters) meaning "island" (島) and "province" (道). 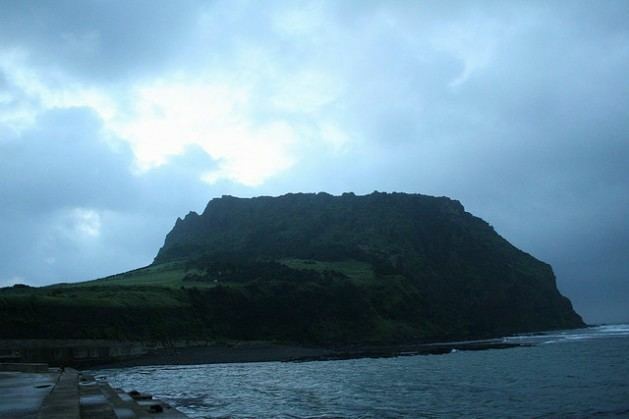 However, Jejudo generally refers to the island, while Jeju-do refers to the government administrative unit. The table below also includes the name of Jeju City, the provincial capital. Because of the relative isolation of the island, the people of Jeju have developed a culture and language that are distinct from those of mainland Korea. Jeju is home to thousands of local legends. Perhaps the most distinct cultural artifact is the ubiquitous dol hareubang ("stone grandfather") carved from a block of basalt. Another distinct aspect of Jeju is the matriarchal family structure, found especially in Udo and Mara, but also present in the rest of the province. The best-known example of this is found among the haenyeo ("sea women"), who were often the heads of families, because they controlled the income. They earned their living from free diving, often all year round in quite cold water, without scuba gear, in order to harvest abalones, conches, and a myriad of other marine products. It is thought that women are better at spending all day deep-water diving because they resist cold better. In the early 1960s, 21% of women on the island were free divers, providing 60% of the island's fisheries revenue. However, because of rapid economic development and modernization, as of 2014 only about 4,500 haenyeo, most aged over 60, were still actively working. Bangsatap are small, round towers made of many stones. There are many Bangsataps and you can see them near the countryside in Jeju. People usually pile up many stones, making a shape like a tower in order to protect themselves from the bad luck in their village. They built Bangsatap according to the theory of divination because they believe that geography is very important in choosing the right place for them. It is also a good example to demonstrate religious belief in Jeju island because it is an object in which people put faith: people put a rice paddle inside the Bangsatap to gather as much money as possible, as well as an iron pot to overcome disaster and fight fire in their village. Nobody knows that when the Bangsatap was built over the year previous. In recent years, Jeju province has become a popular destination for Chinese tourists and commercial developers. These Chinese are enticed to travel to Jeju for a number of reasons, including the island’s close proximity to China (just a two-hour flight from Beijing), Jeju’s policy of allowing foreigners to travel to Jeju without a visa and the willingness of Jeju officials to grant Chinese condominium owners permanent resident status. Because of these attractive policies, the presence of Chinese citizens on Jeju has increased dramatically. According to the New York Times, nearly half of the 6.1 million Chinese tourists who visited South Korea last year visited Jeju, a fivefold increase from 2011. Additionally, Chinese now own 2,050 acres (830 ha) on Jeju, up from just five acres in 2009. While it may be beneficial to Jeju’s economy, this phenomenon has a lot of Jeju residents worried. With the legacy of Japanese occupation still fresh in their minds, some Jeju inhabitants fear their island home is now turning into a "Chinese colony". These fears are exacerbated by China's increased military activity in the East and South China Seas and South Korea’s growing economic reliance on China. More day-to-day concerns include the fact that while the Chinese certainly spend a lot of money on Jeju, much of the money is spent in restaurants and hotels owned by Chinese, not by Jeju residents. Similarly, some residents have expressed anger over Chinese owned hotels and casinos popping up near schools. In a recent poll, 68% of Jeju residents said the influx of Chinese tourists did not help Jeju’s development. The sentiment among many Jeju residents that the Chinese do not respect South Korea or local customs has led to frequent scuffles between locals and Chinese tourists in bars and shops. In June 2007, the South Korean government selected Gangjeong, a village on the southern coast of the island, as the site of a controversial $970 million naval base. Villagers have protested and filed lawsuits to try to block construction and have widely publicized their opposition. According to the census of 2005, of the people of Jeju 32.7% follow Buddhism and 17.5% follow Christianity (10.3% Protestantism and 7.2% Catholicism). 49.8% of the population is mostly not religious or follows indigenous religions. Jeju-do served as one of the host cities of the 2002 FIFA World Cup, with matches hosted at Jeju World Cup Stadium. Jeju City hosted the AIBA 2014 Women's World Boxing Championships at the Halla Gymnasium. Jeju United is the only professional sports club on Jeju-do. Jeju United was runner-up in the K League in 2010. Jeju-do has a famous high school football tournament which began in 1971. Jeju Island is the southernmost and largest island isolated from the Korean peninsula. Due to its lack of fresh water, paddy farming is only done on a small scale on the island, with the cultivation of cereal crops such as millet, barnyard millet, buckwheat, and barley being the main feature of agriculture. Therefore, the traditional Jeju meal generally consists of japgokbap which is a bowl of steamed multiple grains as a main dish, with various salted dried fish called jaban as banchan (side dishes), and a soup based on doenjang (soybean paste) such as baechuguk made with Napa cabbage, kongnipguk made with soybean leaves, or muguk made with radish. Jeju dishes are made with simple ingredients, and the taste is generally salty. Raw seafood called hae is commonly consumed as a part of the meal. The warm weather affects Jeju cuisine in that gimjang, preparing kimchi in late autumn for winter consumption, is not necessary to Jeju, as it is in the other provinces. Only a small amount of kimchi is pickled by Jeju locals. 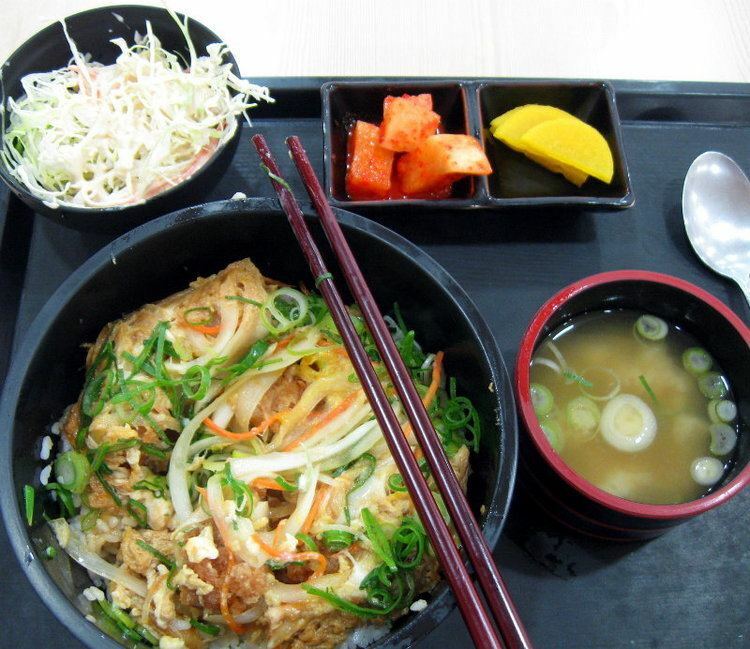 Representative main dishes in Jeju cuisine are porridge made with fish, seafood, seaweeds, or mushrooms. Examples include jeonbokjuk made with abalone, okdomjuk made with red tilefish, gejuk made with crabs, gingijuk made with small crabs called bangge (Helice tridens), maeyeoksae juk made with young miyeok (미역) (wakame), and chogijuk made with shiitake. Gamgyul is a type of orange similar to the Mandarin orange or tangerine, commonly harvested in Jeju island. Black pig is a delicacy on the island as well. Black pigs are famous for their black hair and their meat for its chewy texture. The meat is nutritious but does not have the unique smell of pork. Black pigs other notable features are their long faces, narrow snouts and small ears that stand up. Horse meat is also a delicacy of the island. In Jeju, a tale, myth, legend, folktale do not mean much to the old man. There is the only word, yetmal(Hangul: 옛말, means ‘old language’). This yetmal contains the whole meaning of the tale, myth, legend, folktale. Moreover, it has a meaning of a proverb, tabooed tale, or foreseeing tale. In Jeju, a Story divides into ‘myth’, ‘legend’, and ‘folktale’. These are all passed down in the form of prosaic story and it has characteristics that speaker and listener comes face to face and they share the story goes on. And the story has a common character although all story contains truth, but it is a fiction. This fictional story could be an oral literature but in the eye of ideological aspect, the story also becomes a philosophy. So, the story of Jeju province could be a dream of jeju people, literature, and philosophy by the special condition and the historical circumstance of Jeju island. The characteristic of story of Jeju can be found from the nature legend and historical legend. In the Ahunahopgol legend(Hangul: 아흔아홉골 전설, means ’myth of 99 canyon’), it shows the regret that it cannot produce the King or talented person because of the nature of island. It expesses the geomatical destiny perspective. The historical legends mostly talked about the very strong man. The heroine man is usually set to the starving strong man. The example is the malmurlee legend(Hangul: 말머리전설, means ‘head of horse’). This kind of story shows the limit of the people of Jeju. Although the heroine man is born to strong, they cannot overcome the historical isolation. The myth of Seolmundae Halmang is well known in Jeju. According to this myth, Seolmundae Halmang (Grandmother Seolmundae) could reach from Seongsan Ilchulbong to Guan Tal island at Aewol in a single stride, and with two strides to Mount Halla. She was very strong, had 500 children, and built Mount Halla with seven scoops of earth. One day, Seolmundae Halmang was making soup for her sons while they were out hunting. While they were gone, she fell into the pot and drowned. On their return, they hungrily ate the soup, without knowing that it contained their mother. However, the youngest son knew. He told the truth to the rest of the sons, and the whole family cried, and eventually turned into 500 stones. The Jeju economy has traditionally been supported by primary industry, agriculture and fishing, but tourism has taken a more and more important role as the island receives ten million visitors per year. These are mostly Korean mainlanders but through the opening of the 2010 decade hundreds of thousands of Chinese tourists have been arriving and the number is increasing. In 2006, the GDP of the province was projected at 8.5 trillion won (about US$8.5 billion), approximately 15 million won per capita. The provincial government's budget for 2006 was projected at 1.1 trillion won, an increase of 10% over 2005. Jeju is also a home for key functions of Daum Communications, a leading Korean internet site, and sole owner of Lycos until August, 2010. 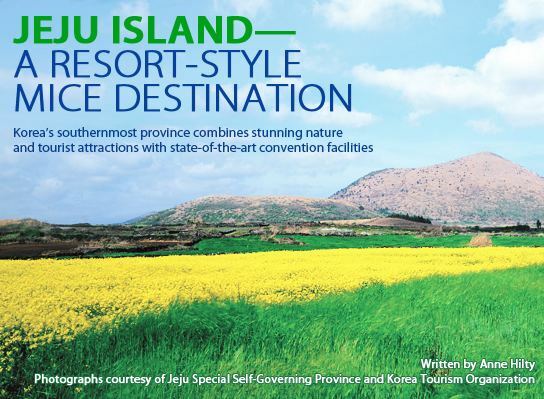 Jeju is also famous for hosting many conferences and international meetings, including the World Scout Conference in July 2008. Jeju has its own international convention center called ICC Jeju. The ASEAN-KOREA Commemorative Summit 2009 was held at ICC Jeju. In 2010, the South Korean central government tasked Jeju Island to develop itself as an international Meetings, Incentives, Conferencing, Exhibitions destination, and since then, the island has hosted a number of notable events such as the 10,000-pax China Baozhen Group incentive and 8,000-pax Amway (South) Korea incentive. In 2010, the destination welcomed 67 events, enabling it to reach 27th spot globally and seventh in Asia in the UIA ranking of global meetings destinations. Tourism commands a large fraction of Jeju's economy. Jeju's temperate climate, natural scenery, and beaches make it a popular tourist destination for South Koreans as well as visitors from other parts of East Asia. The most popular tourist spots on the island are Cheonjeyeon and Cheonjiyeon waterfalls, Mount Halla, Hyeobje cave, and Hyeongje island. There is a variety of leisure sports that tourists can take part in Jeju including golf, horse riding, hunting, fishing, mountain climbing, etc. Depending on the season, Jeju hosts many festivals for tourists including a penguin swimming contest in winter, cherry blossom festival in spring, the midsummer night beach festival in summer, and Jeju horse festival in autumn, among others. For most tourists, traffic to and from the island is mainly taken through Jeju International Airport and transport within the island by rental cars. Some local products are popular with tourists, including Jeju's special tile fish and mandarin oranges, as well as souvenirs and duty-free shopping. Jeju was chosen as one of the New 7 Wonders of Nature through the New 7 Wonders of Nature campaign by the New7Wonders Foundation. The campaign saw hundreds of millions of votes and the top seven wonders were announced on 11/11/11. Museums on the island include Nexon Computer Museum. Hallim Park is one of the oldest and most popular tourist attractions on Jeju. It is located on the west coast of the island. There is an annual fire festival on the island that stems from a custom of removing harmful insects and old grass in villages every winter. The fire festival is held on the fifteenth day of the first lunar month each year. Dal-gip (to pile up much wood) is burned when the moon rises while praying for good harvests and making good wishes. Jeju traditional food is eaten at the site of the festival. This festival was held 13 times until 2009. The ""Jeju Jeongwol Daeboreum Fire Festival"" started in 1997 and become a leading festival of Jeju. This takes place in Saebyeol Oreum located in Bongseong ri, Aewol Eup. It takes up to 25 minutes to reach it from Jeju International Airport by car. Jeju citizens do their utmost to prepare the Fire Festival so as to pass down, develop and ultimately develop branding for the unique folk culture resources of Jeju. Saebyeol oreum has a characteristic of a complex volcano. It has a horseshoe shaped crater that is both very wide and slightly split. Also, it rises high with the little peaks making an oval from the south peak to northwest. The scale is above sea level 519.3 meters (1,704 ft), height of 119 m (390 ft), circumference of 2,713 m (8,901 ft), area of 522,216 m2 (0.201629 sq mi). Saebyeol oreum is the middle size among the 360 oreums in Jeju island. It is named after the saying "it brightens like a star". Olle is a word in the local dialect which refers to the paths between houses and public roads." The Jeju Olle Trail, called Jeju Olle Gil or simply, "jejuolle" in Korean, is a long distance footpath on Jeju Island. The course, mostly following the coastline, consists of 21 connected, numbered main courses, 5 major spurs, and a short spur that connects to Jeju Airport. The courses have an average length of 16 kilometers (9.9 mi) and all together total 404 km (251 mi). The exact length and locations change over time as trails are modified or re-routed. The courses pass through small villages, cross beaches, wind through farms and orchards, twist through forests, climb oreums ("low parasitic volcanoes"), and provide a good look at the lives of average Islanders and the unique natural beauty of Jeju Island. Manjanggul is one of the longest lava tubes in the world. Manjang Cave, situated at Donggimnyeong-ri, Gujwa-eup, North Jeju, 30 km (19 mi) east of Jeju City, was designated as Natural Monument No. 98 on March 28, 1970. The annual temperature inside the cave ranges from 11℃ to 21℃, thus facilitating a favorable environment throughout the year. The cave is also academically significant as rare species live in the cave. Created by spewing lava, "the lava turtle", "lava pillar", and "Wing-shaped Wall" look like the work of the gods. It is considered to be a world class tourist attraction. The Geomunoreum lava tube system is the most impressive and significant series of protected lava tube caves in the world and includes a spectacular array of secondary carbonate speleothems (stalactites and other formations). And it overwhelms other lava tubes with its abundance and diversity. The Geomunoreum Lava Tube System, which is regarded as the finest such cave system in the world, has an outstanding visual impact even for those experienced with such phenomena. It displays the unique spectacle of multi-colored carbonate decorations adorning the roofs and floors, and dark-colored lava walls, partially covered by a mural of carbonate deposits. In addition, lava tube caves are like those in limestone karst in scale, shape and internal decoration, but completely different in origin. Lava tube caves are known from basaltic terrain in most of the world's volcanic regions. The lava tube caves of the Geomunoreum Lava Tube System are, however, regarded as internationally important due to their length, massive volume, intricate passage configuration, well preserved internal lava features, abundant and spectacular secondary carbonate formations, ease of access, and their scientific and educational values. Another feature making Geomunoreum Lava Tube System globally significant and distinctive is the presence of carbonate deposits and formations. Very small deposits of calcite are common in lava tube caves, and are more significantly developed as speleothems in Duck Creek cave in Utah, USA. However, in abundance, density and diversity they are far less impressive than those of Yongcheongul and Dangcheomuldonggul Lava Tubes in Jeju, and the scale of these decorations within the lava caves of Jeju Island far exceeds any other comparable examples. The nomination is supported by the Commission on Volcanic Caves of the International Union of Speleology – the world's most authoritative scientific body on volcanic caves, which regards Jeju's lava caves as being of the highest international ranking. Yongcheongul Lava Tube has been discovered subsequently and is of equivalent value. Sangumburi Crater is the crater of an extinct volcano. Unlike its brethren Halla-san and Songsan Ilch'ubong, this one exploded quickly, but did not spew much lava nor did it form much of a surrounding cone. This phenomenon is called maru in Korean, and Sangumburi is the only one of its kind in the country, making it Natural Monument #263. The remaining crater is 100 m (330 ft) deep and an average of 350 m (1,150 ft)s across. Over 400 species of plants and animals live inside the crater. Visitors can walk around part of the rim (the rest is private property and fenced off), but they cannot venture down inside the crater. A well-paved path leads from the parking area to the viewing area, which has a small pavilion and several vista points. Also on the grounds are numerous grave sites made in traditional Jeju fashion: a wide, trapezoidal stone wall surrounding the burial mound. Several of the sites also have small stone figures that guard the mound from evil spirits. At the park entrance are several large rocks from the crater. During the eruption, molten rock flew from the volcano into the air and cooled into many exotic shapes. Oedolgae is a 20-meter-tall pillar-shaped rock in Sammaebong, Seogwipo. It was created 1.5 million years ago by a volcanic eruption. At the top of Oedolgae, there are several pine trees growing naturally. According to legend, an old woman became a rock after waiting for her husband who went to sea to catch fish and didn’t return for a long time. So people also call it 'halmang bawi' meaning grandmother rock. On the left side of Oedolgae, there is a rock called someri bawi. A large grass area covers the rock, and the surrounding area is great for fishing. Oedolgae is a popular tourist destination, particularly with foreigners. Mt. Halla is the mountain of one of the three gods. It stands at the center of Jeju Island, spreading east and west. The east face is steep, the north side is gentle, and the east and west form a flat, wide highland. Mount Halla is a dormant volcano created by volcanic activities during the quaternary period of the Cenozoic era. It is primarily covered with basalt. On its top is a crater and Baeknok Lake. This mountain is a home to alpine plants and houses as many as 1,800 species of flora. It also boasts luxuriant natural forests and vast grasslands. In addition, precipitous cliffs and slopes and unusual rock formations standing along valleys produce magnificent scenic views. The community of azaleas also adds to the beauty of Mount Halla. Mount Halla's autumnal tints and snow-covered scenes have been selected [by whom?] as the best of the best. The 43-kilometer (27 mi) long Road 5.16 crossing the eastern waist of the mountain from Jeju City to Seogwipo City is considered to be one of the best tourist roads in Korea. Along this road, there are many tourist attractions such as Sancheondan and Seongpanak, and people can enjoy the royal azalea blossoms in spring, lush, green woods in summer, colorful foliage in fall, and a glistening landscape of snow in winter. While enjoying the scenes, the road takes you to Seogwipo City and brings a scenic view of many different beaches. 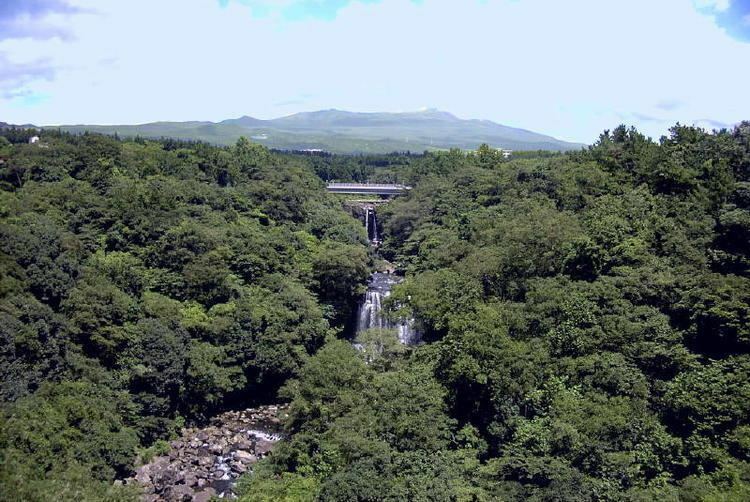 The 37-kilometer-long (23 mi) Road 110 crossing the western waist of the mountain from Jeju-si to Jungmun runs through a high area which is 1,100 meters (3,600 ft) high above sea level, and it passes by Eoseungsang Reservoir, which is a source of water for Jeju islanders. The 99 Passes where, a legend says, neither a king nor a tiger are born because it is one short to 100 passes [?]. It also passes closely by Youngsil Giam (Youngsil Grotesque Rocks). It is possible to climb up to Wetse Oreum along Eorimok Trail and Youngsil Trail and to the top along Seongpanak Trail and Kwaneumsa Temple Trail. Udo, (also called U-island, since do means island) is located on the northeast of Seongsan-ri, 3.5 kilometres (2.2 miles) off the coast of Jeju, South Korea. 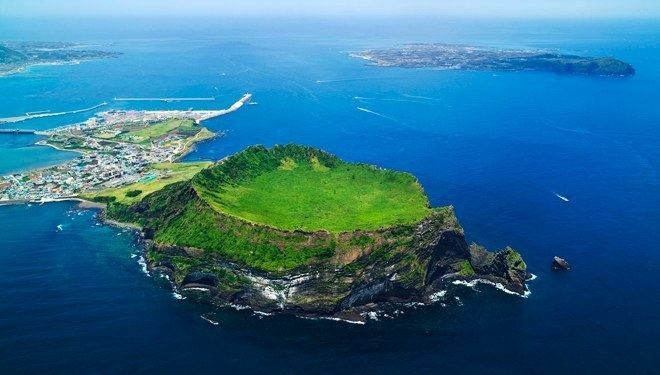 This is the largest of the islands included in Jeju-si. Udo, literally "Cow Island" in Chinese, has this name because it looks like a cow lying down. The whole of Udo is a lava plateau and a fertile flatland where major agricultural products such as sweet potatoes, garlic, and peanuts are produced. There is a parasitic cone, called shoi meori oreum,in the southeast. Jungmun Saekdal Beach is a beach located at the Saekdal-dong, Seogwipo-si. It is located nearby the hotel zone. So the beach has a convenient accessibility. Sinla Jeju hotel, Lotte hotel, Jeju Hana hotel are positioned around 2 kilometers near the beach. Jungmun Saekdal Beach has a particular geographical feature. The beach shore is faced to the North and the Water level of the beach is steady knee height until about 200 meters off the shore. and also there are a lots of great and small waves under the influences of the Maparam(Hangul: 마파람, means the wind from the North in Korean) so the beach is clouded by the people who came from many other regions to enjoy surfing in summer. There are five local newspapers on Jeju Island: the Cheju Daily News, Jeminilbo, Hallailbo, Seogwipo-News, Jejumaeil. The Jeju Weekly is the only print English-language newspaper on the island. JejuWorldWide.com is a daily online news and events Web site which opened in early 2013. TV and radio stations include Jeju Free International City Broadcasting System (an affiliate of SBS), KBS Jeju, and Jeju MBC, and KCTV Jeju.